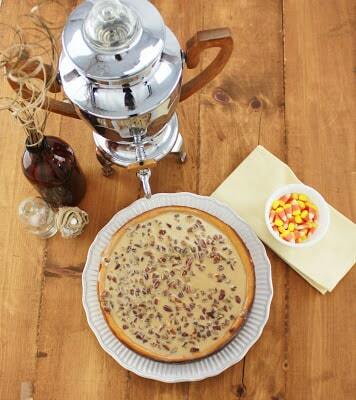 Smooth, fluffy and rich, cheesecake is a favorite among most dessert lovers. The problem that typically comes up is not having enough time to bake your favorite treat. Cut down on prep time by using a Pressure Cooker to bake it instead of a traditional oven. 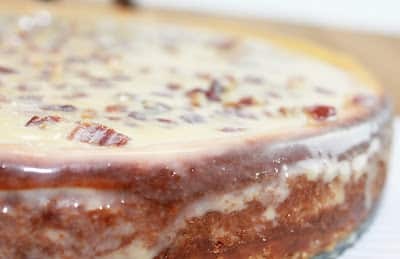 The moisture in the Pressure Cooker makes cheesecakes easier because it gets cooked evenly all the way through, where an oven can cause an overcooked edge, with a middle that’s too soft. The trick to making a smooth cheesecake that’s lump-free is to make sure that all of your ingredients are room temperature before you start. Cream cheese and eggs that are still cold can lead to chunks left in the batter or over-mixing that can add too much air and cause cracking in the surface. Mix crumbs and butter together and press into the bottom of a 7” spring form pan. Blend sugars, cream cheese and maple syrup in bowl until smooth. Add eggs one by one, beating on low just until blended (do not overmix). Gently whisk in the pumpkin, cornstarch, vanilla and pumpkin pie spice. Pour mixture over the crust. Add water and rack to Pressure Cooker. Tear off a 20” piece of aluminum foil and fold into thirds, lengthwise to make a sling for your pan. This helps to remove pan after cooking is complete. Place spring form pan on foil and lower into cooking rack. Cover and lock lid in place. Turn Regulator Knob to PRESSURE. Program for HIGH pressure and cook for 20 minutes. After cooking time, release pressure using the quick release method. Unlock and open lid. Remove cheesecake from Cooker by lifting up the ends of the foil sling. Let cool to room temperature. Refrigerate at least 3 hours, but preferably overnight. Toast pecans using BROWN/SAUTE function, add nuts to cooking pot and stir for 3-5 minutes or until lightly browned. Next, combine whipping cream and maple syrup in cooking pot; bring to a boil still using the BROWN/SAUTE function, stirring occasionally until sauce is slightly thickened about 10-15 minutes. Pour over well chilled cheesecake and refrigerate until well chilled.